Just a warning for anyone attempting to run (CS2) Photoshop, InDesign and/or Illustrator on the new MacBook Pro—Do not load VQ or InDesign. Photoshop and Illustrator seem to run, albeit slowly for some people. Rosetta-the interface program designed interpret non-Universal programs on the new Intel System-is not designed to run CS2. Also, both Apple and Adobe say that CS2 is not compatable with the new MacBook Pro system. For more info from Apple. CS3 is on the way and is expected to be out in the next 6 to 12 months. Needles to say, I learned all this the hard way—several system crashes and many total reloads of my entire system (pain in the axx). So you have not seen may posts from me—sorry. I am back in business. Also, just in case you are interested, I am now using Aperture to manage and edit photos for my blogs; I love it. This program rules for managing most aspects of your digital photos. It can not replace Photoshop for detailed photo manipulations, but it does the basics for dealing with Raw format photos. 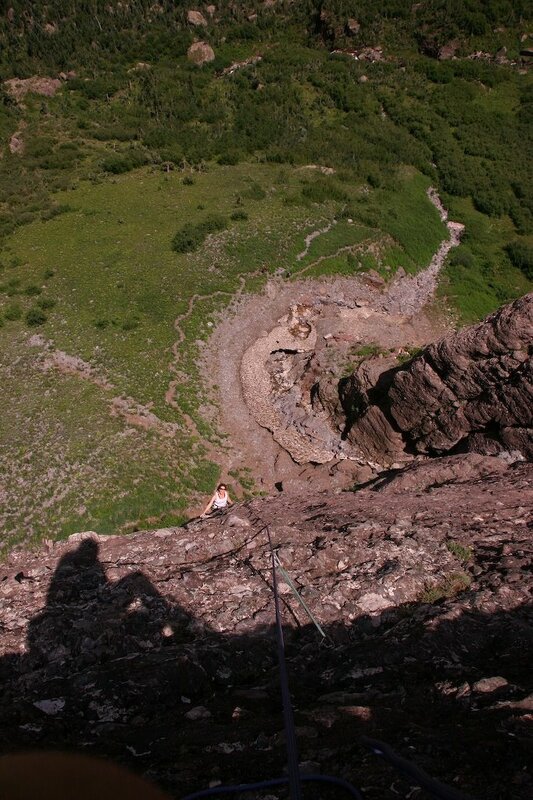 Look forward to posting more…here is a photo from climbing up at the Falls Walls near Telluride this summer. 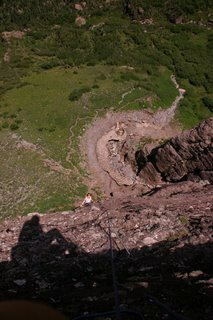 No new routes up at this area, just beautiful views and fun climbs. This area has seen a lot of traffic this summer.